Sangria, a traditional Spanish drink made with wine, fruit and a sweetener, is a classic summer refreshment. To make sangria, soak sliced fruit like strawberries, citrus, grapes or melon in wine overnight; add brandy, sugar syrup and water or lemonade the next day. Once you've made and chilled your sangria, the next step is serving it. Sangria is best when shared with guests -- so make sure you serve it in a container that will hold enough for everyone. In Spain, the traditional serving vessel for sangria is a pitcher with a characteristic "pinched" spout. This narrow opening stops the fruit from tumbling out of the pitcher while pouring. 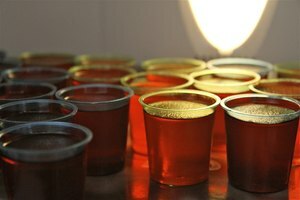 At a party, a punch bowl does just as well. The juicy, wine-soaked fruit is one of the most enjoyable things about sangria, so be sure to provide guests with a ladle -- or a long-handled wooden spoon if you want to be traditional -- to scoop out the fruit. A sangria glass requires a few important traits. It has to be wide enough to hold not only the sangria but large chunks of fruit and ice as well; since these additions make up a lot of sangria's volume, it should also be relatively large. Within these limits, you can serve sangria in any kind of glass, whether a large wine glass, a hurricane glass or a simple cup. As the ice in a pitcher of sangria melts, it will gradually dilute the drink. To avoid this problem, replace the ice with something a little more flavorful. When you're making your sangria, slice some extra fruit and pop it in the freezer. 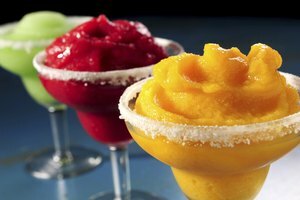 The next day, drop a few pieces of frozen fruit in each glass in lieu of ice cubes. 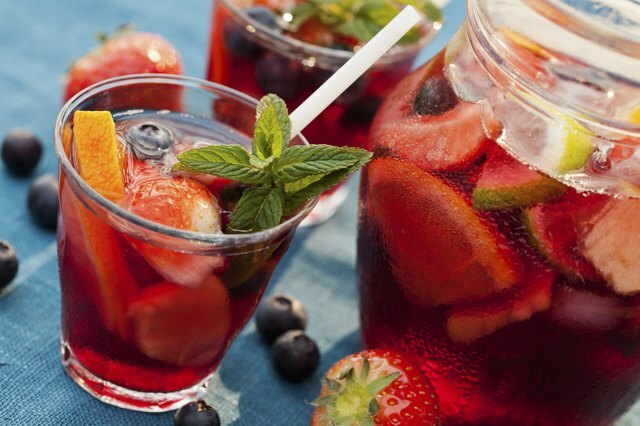 Your sangria will stay cold, but instead of extra water your guests will have a little more fruit to snack on. Sweet and fruity, sangria pairs well with spicy food -- which is good news since it's traditionally served with Spanish or Mexican food. Serve sangria together with a Spanish staple like paella -- this rice dish comes in a heaping communal plate, making it a good choice for sharing. Appetizers like spicy cheese and calamari also go well with sangria; the drink's sweetness complements their hot or garlicky flavors. The Dallas Morning News: The Perfect Pairing for Fiery Foods? Sangria!